Peaches are highly nutritious fruits with juicy pulp having sweet and tart taste with pleasant aroma. Peach fruit has size about the size of a small apple, measuring about 6-10 cm in diameter and weigh about 100g-130g. Depending upon the variety, it features white to creamy-yellow color with a centrally placed single seed enclosed inside the hard shell. Seeds of peaches are inedible with red-brown color, oval shaped and approximately 1.3–2 cm long. Depending upon the seed that is free, semi-free or firmly attached to the pulp, peaches are classified into three groups: freestone, clingstone and semi-freestone. It is believed that peach was first grown in China, before the Romans and Greeks began to grow it. There are more than 2,000 varieties of peaches which are cultivated throughout the world. The People's Republic of China is the world's largest producer of peaches. 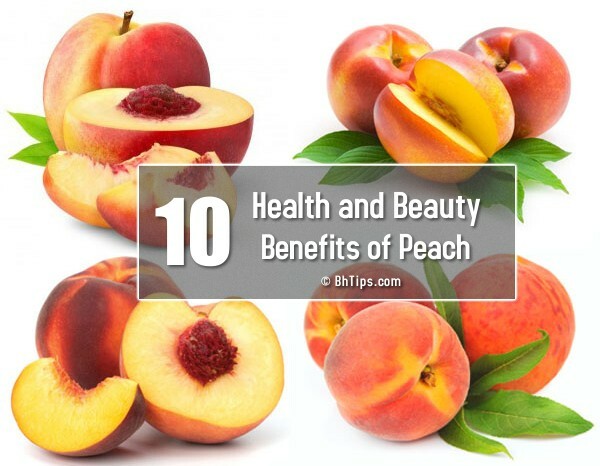 Peaches are the storehouse of numerous vitamins, minerals and phytonutrients. The season for fresh peaches is from May until October. During this season you can consume as many peaches as you can, to help nourish your body with all these essential nutrients as many as possible. Peach contain a good amount of Vitamin K which is very important for keeping the heart healthy. Vitamin K prevents the blood from clotting and protects against many heart diseases. heart diseases.The lycopene and lutein in peaches also significantly reduce your risk of developing heart disease. Peach contain a good amount of Potassium which is an important component of cell and body fluids that help regulate blood pressure and heart rate. Deficiency of iron cause blood anemia. Peach contain a good amount of iron which not only increases blood production but also keeps blood healthy and prevents against iron-deficiency anemia. High fiber contents in peaches regulate bowel movements and prevent constipation. Peaches are known to ease digestion by stimulating gastric secretions. Peaches are a great source of beta carotene. Individuals with sight problems are often deficient in beta carotene, so consuming peaches will help up your beta carotene levels and nourish the health of your eyes. This compound also helps prevent night blindness and age-related macular degeneration. Peaches are a great way to cleanse out toxins from your colon, kidneys, stomach and liver. The high fiber content pushes out any toxic excess waste matter from your colon, and helps protect against colon cancer. The potassium in peaches are great for reducing kidney related diseases and helps to cleanse your bladder. The concentration of potassium and other vitamins in this peaches allows your body to maintain normal kidney and liver function. Eating peaches also help a lot to prevent and eliminate kidney stones. Peaches are the perfect snack food for losing weight. A peach makes you feel full and keeps you away from overeating. One peach only contains about 35-50 calories and no saturated fat.Thus provides you lots of nutrients but very less calories which is best thing for weight loss. Vitamin A and C make peaches a great natural moisturizer and prevent skin dryness. Due to high contents of Vitamin A and C peaches are often used in commercial moisturizers and skin masks.Rubbing some peach pulp on your skin for 2-3 minutes and let it stay on the skin for 5-10 minutes to absorb the ingredients and then wash with fresh water.This is a great way to slough away dead skin and to allow the peach enzymes to nourish and freshen up your skin. High antioxidants contents in peaches fight against skin damaging free radicals, prevent premature wrinkles and slowdown aging process.